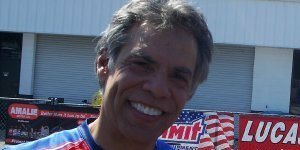 Despite setting a pair of records for Gateway Motorsports Park, Lucas Oil Buell rider Hector Arana Sr. left town disappointed after a second-round exit Sunday in the AAA Insurance NHRA Midwest Nationals. Arana looked strong in qualifying when he raced his Pro Stock Motorcycle to a double track record pass of 6.796 seconds at 198.58 mph, grabbing his third No. 1 qualifier in the last four races and his second in a row. But in Sunday’s quarterfinal round in a race against LE Tonglet, Arana slowed to a pass of 6.916 seconds at 194.58 mph. It was a wild ride for Arana as his bike made a big move towards the center of the track, nipping into his time. Tonglet’s margin of victory was .008 seconds, or less than two feet. Arana’s Lucas Oil team is now headed home to get the engines ready for the final three races of the six-race Countdown playoffs. The 2009 champ is currently tied for second place with his son Hector Arana Jr. in the points standings, just 75 points out of first. The NHRA tour now heads to Maple Grove Raceway in Reading, Pa., for next weekend’s Auto-Plus NHRA Nationals. “We are ready for Reading, and we have as much time as anyone else so we should be ready.” Arana said. “We are going to go home and have a day just to look at the bikes and service them there so we won’t have to do that in Reading.